These Come From Trees Blog: Wow! 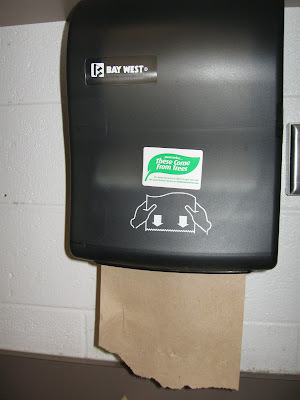 29% paper towel use reduction at Hunt Valley Elementary School! Wow! 29% paper towel use reduction at Hunt Valley Elementary School! 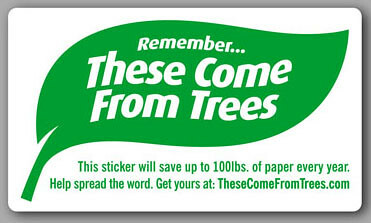 About a year ago, an enterprising teacher from Hunt Valley Elementary School, named Ben James reached out to us to participate in the These Come From Trees K - 12 Education Challenge, and to apply for some complimentary These Come From Trees stickers for posting up around at their school. A year later...18 trees and $840 in paper towels saved! Well, wouldn't you know it, Ben emailed us the other day to let us know that they were doing a post-analysis on their conservation efforts, in particular, looking at how their paper towel conservation worked. The year before Ben posted the TCFT stickers, Hunt Valley used 129 cases of paper towels--with eight rolls per case and six pounds per roll, that's 6200 pounds of paper! This year, the school ended up only using 95 cases--34 fewer than last year! Even better, 34 cases of paper towels equals out to 1800 pounds of paper towels. With about 100 pounds of paper coming out of a given paper pulp tree, that means that Hunt Valley saved around 18 trees worth of paper in one year, with the help of TCFT stickers. Not bad, guys! This well-documented case study was great news, because our own testing that provided the "15%" number that we quote on the site was a pretty lightweight, week-long test at a coffee shop--and while we've wanted to do a more meaningful study to gauge impact of TCFT stickers, well, the day job keeps getting in the way! This data from the folks at Hunt Valley is great proof of These Come From Trees stickers contributing to a successful conservation strategy, whether at a elementary school, high school, higher education institution, or business organization! I would encourage you to forward this blog post to your facilities team at your office, school, and so on, and see if they can't use TCFT stickers to reduce unintentional overuse of paper towels at your place of work / study! Very cool, Pete. To make that even stronger it would be cool if you could test the effect of the sticker vs. no sticker on the same user population. Like put it up in half the bathrooms somewhere for a month and use the non-stickered bathrooms as a control to see which one had greater change in usage, given the same users. 1. Would love to do a more robust study, but, again, the day job somewhat intervenes! This study by Hunt Valley gets us directionally there, though! 2. Corporatization would be key. Problem is the conflicting incentives. The folks who sell paper towel dispensers also, you guessed it, sell the paper towels that go in them. Razor and blades business model. So they don't exactly have an incentive to reduce overuse of the towels. However, you do see movement towards this with the dispensers that are motion-activated and have time-outs that make a user *really work* to get another length of towel out. Subscribe to the blog, buddy! ...and it continues at a new school. Thanks for the resupply for Cunningham Park, Pete! Posting stickers on every corner would be a great idea for more people will be able to see this post.Having an active participation in this kind of campaign will be an advantage for you can be able to raise awareness of the public when it comes to paper towel consumption. Not just with paper towel usage, we can definitely find ways to cut back with paper consumption especially in schools. It would be best to make young people aware of the possible effect of not caring for out natural resources. Thanks for the info! am i the only one who sees the big, giagantic hole behind this logic? its a good idea... but are stickers not made from trees as well? just a thought. we have a tendency to’re living in robust economic times during which we have a tendency to may all stand to avoid wasting a very little extra money wherever and however we can. the positioning offers you a staggering variety of benefits when it comes to buying your towels wholesale. You can use the containers Wizard to create an active document containers by selecting the Active document containers check box on the Compound Document Support page of the containers Wizard. For more information, see Creating an Active Document containers Application. Given the saving in trees in comparison to the small amount of paper used for a single sticker, your observation hardly seem astute. Lolepicshop- The Best Shop to Sell Your LoL Account. Sell League of Legends account easily and also Buy Unranked Level 30 LoL Accounts shop. Really great content! LOoking forward for more posts from you. Regards. High rank of website in internet indexes pertinent direct individuals to any site. Therefor, endless open doors square measure accessible within the field of SEO that square measure requesting. Thank you for your efforts. This blog is very impressed to me and I got a lot of information to your post. Please keep it. Learned a lot from your blog, keep up the good work and share more like this. I really enjoyed very much with this article here. Really it is an amazing article I had ever read. I hope it will help a lot for all. Thank you so much for this amazing posts and please keep update.